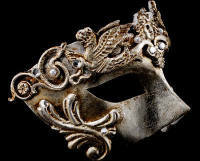 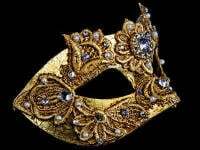 This must have mask is painted in aged effect antique gold and adorned with ornate designs - Great for men. 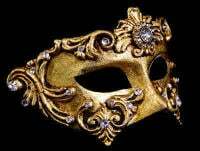 Another must have from Simply Masquerade for any masquerade ball that you attend, this Fuoco Luxury Mask - Gold is simply stunning. 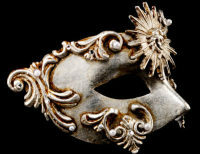 Timeless enough to wear to every party & elegant enough to match with any outfit, this gorgeous luxury mask will brighten up all of your looks and add that touch of glamour that you deserve. 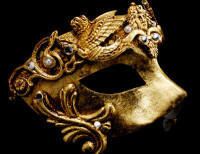 Designed in glistening gold with deep set scrolls this chic mask features a robust but refined design & faux diamond crystals that glitter from every angle..
With traditional black satin ties for comfort & security the Fuoco is more suitable for a man to wear but of course can be worn by anyone as most masks are unisex.